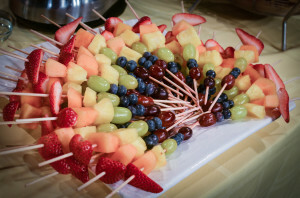 Take a long, 12-inch bamboo skewers and gently skewer the fruit, taking care to do them in the same order every time. It works better to have the larger chunks of fruit at the top, and the smaller at the bottom. (optional) When finished, cut off the sharp tips of the skewers using a kitchen knife. Arrange them with the points coming together, to make a rainbow. Enjoy!